BAGHDAD -- As the Iraqi government bolstered Baghdad's defenses Sunday, the Islamic militant group that captured two major cities last week posted graphic photos that appeared to show its fighters massacring dozens of captured Iraqi soldiers. The pictures on a militant website appear to show masked fighters of the Islamic State of Iraq and Syria, or ISIS, loading the captives onto flatbed trucks before forcing them to lie face-down in a shallow ditch with their arms tied behind their backs. The final images show the bodies of the captives soaked in blood after being shot. They're not the only images showing how ISIS, also known as the Islamic State of Iraq and the Levant, or ISIL, punishes captured Iraqi soldiers. CBS News correspondent Clarissa Ward reports from Baghdad that a video appears to show Iraqi special forces soldiers being interrogated by Sunni militants. The soldiers are denounced as unbelievers and shot one by one in the back of the head. The grisly images could further sharpen sectarian tensions as hundreds of Shiites heed a call from their most revered spiritual leader to take up arms against the Sunni militants who have swept across the north. ISIS has vowed to take the battle to Baghdad and cities further south housing revered Shiite shrines. Late Sunday, the State Department announced it will move some U.S. Embassy workers out of Baghdad because of the violence. The workers will be temporarily relocated to consulates in Basra and Erbil and to a support unit in Amman, Jordan, State Department spokeswoman Jen Psaki said in a statement. The embassy will remain open, and additional U.S. security personnel will be added to the embassy's staff, Psaki said. Who's behind the Islamist insurgency in Iraq? While the city of seven million is not in any immediate danger of falling into the hands of the militants, Sunday's bombings could raise tensions. Food prices in the city have risen, twofold in some cases, because of disruption to transport on the main road heading north from the capital. The government bolstered defenses around Baghdad Sunday, a day after hundreds of Shiite men paraded through the streets with arms in response to a call by Grand Ayatollah Ali al-Sistani for Iraqis to defend their country. ISIS has vowed to attack Baghdad but its advance to the south seems to have stalled in recent days. Thousands of Shiites have also volunteered to join the fight against ISIS, also in response to al-Sistani's call. Despite the added security, a string of explosions killed at least 15 people and wounded more than 30 in the city, police and hospital officials said. One car bomb went off in the city center, killing 10 and wounding 21. After nightfall, another explosion hit the area, killing two and wounding five. The third went off near a falafel shop in the city's sprawling Sadr City district, killing three and wounding seven. Baghdad has seen an escalation in suicide and car bombings in recent months, mostly targeting Shiite neighborhoods or security forces. Armed police, including SWAT teams, were seen over the weekend manning checkpoints in Baghdad, searching vehicles and checking drivers' documents. Security was particularly tightened on the northern and western approaches of the city, the likely targets of any advance by ISIS fighters on the capital. The city looked gloomy on Sunday, with thin traffic and few shoppers in commercial areas. At one popular park along the Tigris river, only a fraction of the thousands who usually head there were present on Sunday evening. In the commercial Karada district in central Baghdad, many of the sidewalk hawkers who sell anything from shoes to toys and clothes were absent. The crisis in Iraq has prompted the United States to order an aircraft carrier into the Persian Gulf. It also laid out specific ways for Iraq to show it is forging the national unity necessary to gain assistance in its fight against ISIS and other militants. Defense Secretary Chuck Hagel on Saturday ordered the USS George H.W. Bush from the northern Arabian Sea as President Obama considered possible military options for Iraq. Hagel's press secretary, Rear Adm. John Kirby, said the move will give Mr. Obama additional flexibility if military action were required to protect American citizens and interests in Iraq. Accompanying the carrier will be the guided-missile cruiser USS Philippine Sea and the guided-missile destroyer USS Truxtun. The ships, which carry Tomahawk missiles that could reach Iraq, were expected to complete their move into the Persian Gulf by the end of the day. The Bush's fighter jets also could easily reach Iraq. In neighboring Iran, the acting commander of the Islamic Republic's army ground forces, Gen. Kiomars Heidari, said Iran has increased its defenses along its western border with Iraq, though there was no immediate threat to the frontier. In Baghdad, Iraqi government officials said ISIS fighters were trying to capture the city of Tal Afar in northern Iraq on Sunday and raining down rockets seized last week from military arms depots. The officials said the local garrison suffered heavy casualties and the town's main hospital was unable to cope with the number of wounded, without providing exact numbers. Iraq's top military spokesman, Lt. Gen. Qassim al-Moussawi, confirmed that fighting was raging at Tal Afar, but indicated that the militants were suffering heavy casualties. On all fronts north of the capital, he said, a total of 297 militants have been killed in the past 24 hours. ISIS and allied Sunni militants captured a vast swath of northern Iraq last week, including second city Mosul and Saddam Hussein's hometown of Tikrit, as Iraqi troops, many of them armed and trained by the U.S., fled in disarray, surrendering vehicles, weapons and ammunition to the powerful extremist group, which also fights in Syria. The captions of the photos say the killings were to avenge the killing of an ISIS commander, Abdul-Rahman al-Beilawy, whose death was reported by both the government and ISIS shortly before the al-Qaida splinter group's lightning offensive, which has plunged Iraq into its bloodiest crisis since the withdrawal of U.S. troops in 2011. "This is the fate that awaits the Shiites sent by Nouri to fight the Sunnis," one caption read, apparently referring to Iraq's Shiite Prime Minister Nouri al-Maliki. Al-Moussawi, the military spokesman, confirmed the photos' authenticity and said he was aware of cases of mass murder of captured Iraqi soldiers in areas held by ISIS. U.N. human rights chief Navi Pillay warned on Friday of "murder of all kinds" and other war crimes in Iraq, and said the number killed in recent days may run into the hundreds, while the wounded could approach 1,000. Speaking in Geneva, she said her office has received reports that militants rounded up and killed Iraqi soldiers as well as 17 civilians in a single street in Mosul. Could U.S, Iran support end ISIS momentum? Her office also heard of "summary executions and extrajudicial killings" after ISIS militants overran Iraqi cities and towns, the statement said. The captions did not provide a date or location, but al-Moussawi said the killings took place in Salahuddin province, the capital of which is Tikrit. Some of the pictures appeared to show some of the soldiers pleading for their lives, others seemed terrified. All soldiers appeared in their early 20s, with some wearing the jerseys of such European soccer clubs like Manchester United and Barcelona. 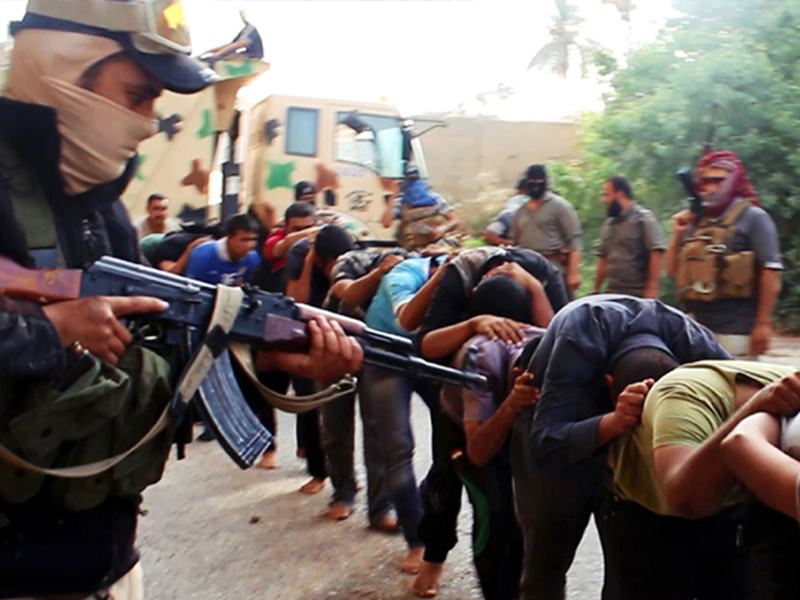 Some of the militants wore black baggy pants and shirts, many of them had sandals or flip flops. Martin Frank, the CEO of IQ Networks, an Internet service provider in Iraq, told The Associated Press that authorities have ordered multiple social media sites including YouTube, Facebook and Twitter to be blocked. On Sunday, they tightened the restrictions further by telling network operators to halt traffic for virtual private networks, which allow users to bypass Internet filters. Internet traffic in several areas overrun by militants, including Mosul and Tikrit, was ordered to be cut off altogether, he said. No timeframe was given for the shutdowns.